This article is about the currency. For crown jewel, see Crown of Saint Wenceslas. For the political party, see Koruna Česká (party). For CZK airport, see Cascade Locks State Airport. The koruna (sign: Kč; code: CZK) is the currency of the Czech Republic since 1993, and in English it is sometimes referred to as Czech crown or Czech krone. The koruna is one of European Union's 11 currencies, and the Czech Republic is legally bound to adopt the euro currency in the future. The official name in Czech is koruna česká (plural koruny české, though the zero-grade genitive plural form korun českých is used on banknotes and coins of value 5 Kč or higher). The ISO 4217 code is CZK and the local acronym is Kč, which is placed after the numeric value (e.g., "50 Kč") or sometimes before it (as is seen on the 10-koruna coin). One koruna equals 100 haléřů (abbreviated as "h", singular: haléř, nominative plural: haléře, genitive plural: haléřů – used with numbers higher or equal to 5 – e.g. 3 haléře, 8 haléřů), but haléře have been withdrawn, and the smallest unit of physical currency is 1 Kč. In 1892, the Austro-Hungarian krone replaced the gulden, at the rate of one gulden equaling two kronen (which is also the reason why the 10-koruna coin is still nicknamed pětka or "the five" by the Czechs). The name "krone" was invented by the emperor, Franz Joseph I of Austria. After Austria-Hungary dissolved in 1918, the only successor state that kept the name of the currency, the koruna, was Czechoslovakia. In the late 1920s, the Czechoslovak koruna was the hardest currency in Europe. During the Second World War, the currency on the occupied Czech territory was artificially weakened. The Czechoslovak koruna was restored after the war. It underwent a highly controversial monetary reform in 1953. The Czech koruna replaced the Czechoslovak koruna when it was introduced in 1993 after the dissolution of Czechoslovakia. It first consisted of overstamped 20-, 50-, 100-, 500-, and 1000-Czechoslovak koruna banknotes, but a new series was properly introduced in 1993. In November 2013, the Czech National Bank (ČNB) intervened to weaken the exchange rate of the koruna through a monetary stimulus to stop the currency from excessive strengthening. In late 2016, the ČNB stated that the return to conventional monetary policy was planned for mid-2017. After higher-than-expected inflation and other figures, the national bank removed the cap on a special monetary meeting on April 6, 2017. The koruna avoided significant volatility and City Index Group stated: "If you want to drop a currency peg, then the ČNB can show you how to do it". The Czech Republic planned to adopt the euro in 2010, but its government suspended that plan indefinitely in 2005. Although the country is economically well positioned to adopt the euro, there is considerable opposition to the move within the Czech Republic. According to a survey conducted in April 2014, only 16% of the Czech population was in favour of replacing the koruna with the euro. As reported by an April 2018 survey by CVVM (Public Opinion Research Center), this value has remained at nearly identical levels over the past four years, with only 20% of the Czech population above 15 years old supporting euro adoption. The coins of the Czech koruna increase in size and weight with value. 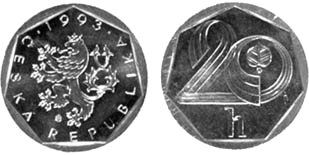 In 1993, coins were introduced in denominations of 10, 20 and 50 haléřů, 1, 2, 5, 10, 20 and 50 korun. The 10- and 20-haléřů coins were taken out of circulation by 31 October 2003 and the 50-haléřů coins by 31 August 2008 due to their diminishing purchasing power and circulation. However, financial amounts are still written with the accuracy of 1-haléř (CZK 0.01); prices in retail shops are usually multiples of CZK 0.10. When transactions are made, the amount is rounded to the nearest integer. In 2000, the 10- and 20-korun coins were minted with different obverses to commemorate the millennium. In 1993 and 1994, coins were minted in Winnipeg and Hamburg, then in the Czech Republic. 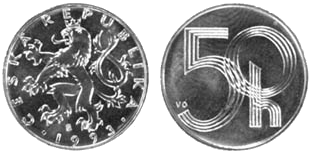 The 10- and 50-korun coins were designed by Ladislav Kozák [cs] (1934–2007). Since 1997, sets for collectors are also issued yearly with proof-quality coins. Also, a tradition exists of issuing commemorative coins – including silver and gold coins – for numismatic purposes. For a complete listing, see Commemorative coins of the Czech Republic. The first Czech banknotes were issued on 8 February 1993 and consisted of Czechoslovak notes with adhesive stamps affixed to them. Only the 100-, 500- and 1,000-korun notes were overstamped, the lower denominations circulated unchanged during this transitional period. Each stamp bears a Roman and Arabic numeral identifying the denomination of the banknote to which it is affixed (C and 100, D and 500, M and 1,000). Subsequent issues of the 1,000-korun note replaced the adhesive stamp with a printed image of same. A newly designed series of banknotes in denominations of 20-, 50-, 100-, 200-, 500-, 1,000 and 5,000-korun were introduced later in 1993 and are still in use at present – except for 20, 50 and the first versions of 1,000 and 5,000 korun notes, since the security features of 1,000 and 5,000 notes were upgraded in the subsequent issues (The 2,000 korun note, which was introduced in 1996, is still valid in all versions, with and without the new security features). These banknotes feature renowned Czech persons on the obverse and abstract compositions on the reverse. Modern protective elements can be found on all banknotes. The Greater coat of arms of the Czech Republic can be found on the reverse side of all denominations. For the 100th anniversary of the Czechoslovak koruna, a new banknote will be created, featuring the face of Czech politician Alois Rašín. There is also an overprint on the normal 100 Korun note as second commemorative note. The currency was on a record exchange rate run in 2008. ^ "Czech Koruna Approaches Euro Cap: Intervention Policy Explained". 8 July 2015. Archived from the original on 15 December 2017. Retrieved 4 May 2018 – via www.bloomberg.com. ^ "Czech Central Bank Zeros In on Ending Koruna Cap in Mid-2017". 29 September 2016. Archived from the original on 19 January 2018. Retrieved 4 May 2018 – via www.bloomberg.com. ^ "Czech Central Banker Quashes Bets on Earlier Koruna Cap Exit". 13 September 2016. Archived from the original on 17 February 2018. Retrieved 4 May 2018 – via www.bloomberg.com. ^ "Czechs Trigger Long-Awaited Koruna Float Without Swiss Shock". 6 April 2017. Archived from the original on 18 June 2017. Retrieved 4 May 2018 – via www.bloomberg.com. ^ "Finance Ministry backtracks on joining the Euro by 2012". Radio Praha. Archived from the original on 7 February 2009. Retrieved 22 December 2008. ^ "Euros in the wallets of the Slovaks, but who will be next?" (Press release). Sparkasse.at. 5 August 2008. Archived from the original on 4 September 2006. Retrieved 21 December 2008. ^ "Archived copy" (PDF). Retrieved 28 November 2018. ^ "The CNB decides 50-heller coins will cease to be legal tender". Archived from the original on 14 April 2008. Retrieved 20 January 2008. ^ "Platidla ČR (1993–20..) – Papírová platidla, bankovky". Papirovaplatidla.cz. Archived from the original on 16 November 2014. Retrieved 19 August 2014. ^ "ČNB". www.cnb.cz. Archived from the original on 4 May 2018. Retrieved 4 May 2018. ^ "Czech Republic to replace 50-koruna note with coin 01.04.2011 - Banknote News". banknotenews.com. Archived from the original on 25 August 2014. Retrieved 4 May 2018. ^ "Rašín Alois". zlate-mince.cz. Zlatemince.cz. Retrieved 6 July 2018. ^ "Czech crown extends record run, eyes on CPI". Forbes. 7 July 2008. Archived from the original on 4 June 2011. Wikimedia Commons has media related to Money of the Czech Republic. This page was last edited on 8 April 2019, at 11:08 (UTC).